Do You Have Receding Gums? Consider a Lunchtime Gum Lift™! Many factors can contribute to gum tissue becoming lost, leaving the roots of your teeth at risk: growing older, periodontal disease, even brushing too hard. When your gums recede and the root structure of your tooth is exposed, the chances of decay, sensitivity, and other infections increase exponentially. Since healthy gums are essential to maintaining healthy teeth, getting gum recession treated as soon as possible is a vital step in your oral care. After advanced training, Dr. Brent is excited to offer a minimally invasive newer technique known as the Chao Pinhole® Surgical Technique (PST™). In just one visit, Dr. Brent can treat as many teeth as needed, and you will have minimal recovery time! No grafts, no stitches, and no incisions! With Pinhole Gum Rejuvenation, a small hole is created in the gums, and the gum tissue is gently released and shifted to cover the root structure. Your existing tissue is simply moved to a better position. The results are natural-looking and long-lasting. Ask us if this treatment is right for you. Pinhole consultations are always free. 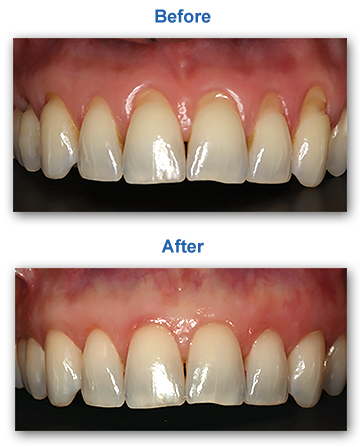 If you have receding gums, schedule a visit online or call us at (913) 220-2209 to learn more about this technique!